Lagoon is located about seventeen miles north of Salt Lake City. It has ten roller coasters, five of which are unique to this park. 1) The Midway, containing the majority of the rides and an assortment of carnival type games and food outlets. 2) Pioneer Village which has several exhibits displaying pioneer buildings and artifacts. 3) Lagoon-A-Beach, a water park which is included in the regular admission price. 4) Kiddie Land with several rides for small children. 5) The X-Venture Zone featuring more extreme rides that cost extra. Lagoon also offers a full-service RV park, a campground, and a shaded walking trail outside the park that stays open all year. Machine 5: (Labeled Machine 1 on machine) Located in the Cannibal gift shop. 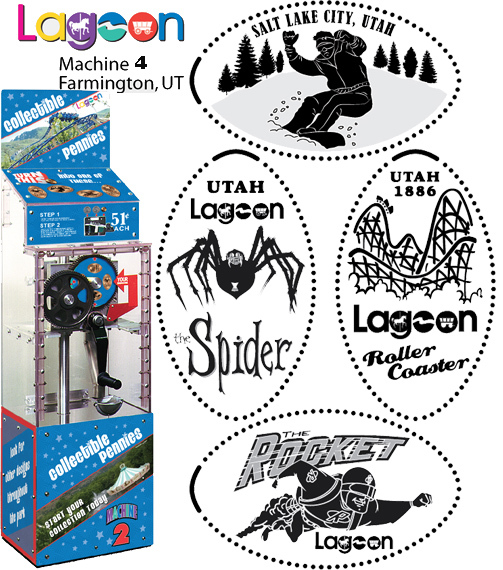 thegillion added Lagoon Amusement Park to system.